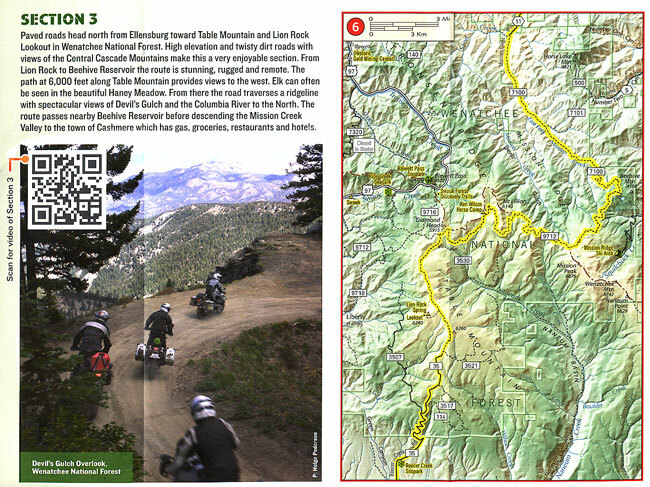 Two innovative motorcycle-travel maps that depict "Backcountry Discovery Routes" in Washington State and Utah span the divide between print and digital publishing, providing trip planners with essential cartographic data and access to video. And they're available now, in time to plan this season's backcountry ride or drive. Butler Motorcycle Maps' information-packed Washington Backcountry Discovery Route (WABDR; 575 miles; 925 km) and Utah Backcountry Discovery Route (UTBDR; 871 miles; 1,402 km) ($14.95 ea.) can help travelers more efficiently plan full or partial trips on these two off-highway road systems. The Washington and Utah routes are components of an expanding network of dirt-road routes being spearheaded by Seattle-based adventure-motorcycling gear retailer Touratech USA and its partners. A Colorado route is coming soon, and Arizona is in the works. Other Western states -- including California -- are expected to be added over the next few years. Backcountry Discovery Routes, a nonprofit initiative, is a community-based effort to establish and preserve off-highway routes for adventure-motorcycle and dual-sport travel. For backcountry travelers, this evolving network may be the most exciting development since the federal Bureau of Land Management long ago launched its National Back Country Byways system. The maps are printed on tough, waterproof coated paper, and will undoubtedly endure the rigors of backcountry riding. Rich in useful data, the maps break new ground by incorporating QR codes, a type of barcode. The codes can be conveniently scanned with smart phones, iPads, iPod Touches and other mobile devices for Internet access to additional data, such as route conditions and videos of the route. This is in addition to providing elevation contours and shaded-relief depictions of the topography. To download a scanning app, Butler suggests www.getscanlife.com. (There are other sources.) Once downloaded, just open the app, aim the camera of your device at the QR code for the Backcountry Discovery Route segment you want to view, and up pops a video. You'll see Touratech rider-researchers traveling on and discussing the route. 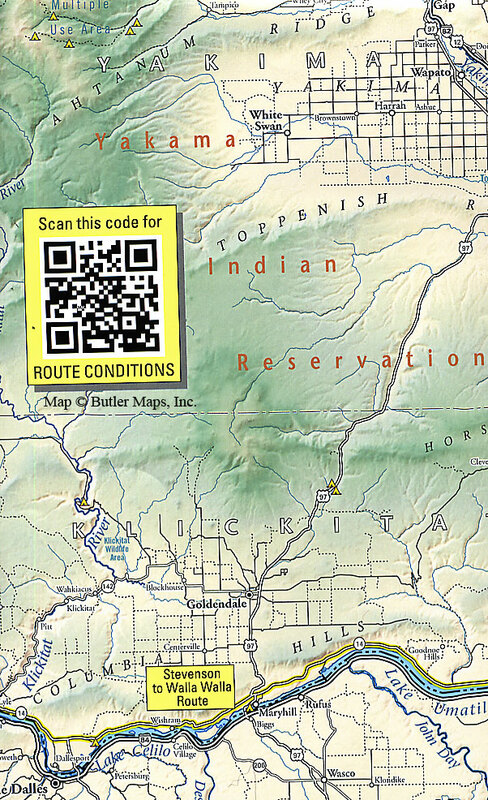 QR codes aside, when I first became familiar with Butler Maps I was impressed that they were building on the work of Allan Cartography, Inc. Based in Medford, Oregon, USA, Allan Cartography produces Benchmark Road and Recreation Atlases, the best in the atlas genre. Even in the era of GPS, I never travel without several paper maps. I use GPS, although not as effectively as I should. I find Garmin's MapSource a useful tool that is sometimes incomplete and unreliable. I'm using Google Earth more and more every day as well. The bottom line: It's important to use multiple references -- digital and print. Good paper maps remain not only relevant, but indispensable. excellent zoomed-in views of route sections, with elevation contours. These are important because they enable this one map to serve the purpose of two that I always carry: a big-picture map, useful for understanding my location regionally; and a detailed, zoomed-in map for navigation. The Washington BDR map spotlights only that one route, which is a compilation of outstanding dirt roads linked into one north-south route. Same with the Utah BDR map. When you look at the maps, you'll quickly see that you don't have to do the whole route. Both trans-state routes can be traveled in segments. There are plenty of access and exit points that can accommodate a traveler who only wants to ride or drive a section or two. Unfortunately, the Utah BDR map omits labeling of the U.S. Bureau of Land Management's National Back Country Byways, unpaved roads of special scenic, cultural and historical significance. Routes in the state of Utah's similar Scenic Backways network also are not labeled. Both programs are intended for backcountry riders and drivers -- the same people for whom the UTBDR is intended. Fuel can be a big issue in adventure motorcycling because 200 miles (322 km), maybe more but often less, is about as far as many ADV bikes can go on a tank of gas. The WABDR map has no graphical indicators of fuel locations on the roadmap side. But that isn't a problem in for this route, since distances between cities and towns are not great. (The WABDR is divided into six sections, the longest 122 miles (196 km) and the shortest 62 miles (100 km). There's no reason to run out of fuel on the WABDR. The UTBDR map, which covers a far more rural state, does indicate where you can expect to find fuel (although gas stations and quickstops do go out of business and some may close on Sundays). This may be important on this route because of the distances of each section: the longest is 196 miles (315 km), the shortest 104 miles (167 km). Even so, the UTBDR doesn't include the remotest reaches of Utah, and there are plenty of easy detours for fuel access. clear fuel icons that are aligned with the mileage graph so you can see how far it is between fuel stops. Innovative and useful as this chart is, it seems almost buried amid a graphically busy page of similarly useful, information-filled boxes and visuals (including QR codes). Being in a rush, as Web readers often are, I missed it; my bad. But it also seems almost overwhelming in a world where the Web has made easy scannability important. When I conveyed my impressions to Butler Motorcycle Maps' principal Court Butler, he said that consumers could look forward to continuing improvements with each new edition. He said he encourages input from consumers on how to improve the maps. "We welcome all of the feedback," Court told me. "That's how we keep making our maps better and better." GPS users will appreciate that Touratech generously makes the tracks for the routes freely downloadable on each route's website. These are outstanding maps -- packed with useful information for both trip planning and reference while traveling. They represent an ambitious effort to provide value, utility and durability, and they accomplish that. That said, I view them as components of a suite of references one should use. I will use them in planning future rides and drives; in fact, I already am. Yet I will continue to draw on my full suite of references, print and digital, and I can't imagine one tool alone ever changing that. Note: You can order maps online directly from Butler Motorcycle Maps. And you can find out more and follow the latest news about the Backcountry Discovery Route initiative at the leading online adventure-riding forum, Adventure Rider. Here's a ride report from the WABDR. Disclosure: Butler Motorcycle Maps and Benchmark Maps have provided me with free review and reference copies. Benchmark paid me to help copy-edit a revision of their Idaho atlas.